I guess it was around 2005 or so that I quit watching the highly popular Oprah Winfrey daily TV show. I admired her philanthropic efforts and her work in providing education for girls in Africa, among other things. But the afternoon she said that there were many ways to God, I quit watching. And I mourned the millions of women who would follow her down that false spiritual path... simply because Oprah said it was OK. In the past, she has insisted that she is a Christian with statements like this: “I am not talking about religion. I am a Christian. That is my faith. I'm not asking you to be a Christian. If you want to be one I can show you how. But it is not required. I have respect for all faiths. All faiths. But what I'm talking about is not faith or religion. I'm talking about spirituality" ... and then there is this: "My favorite Bible verse—because I am Christian—is Acts 17:28. It says, ‘In God I live and move and have my being’,” Winfrey said. “And you want to know why I'm so successful? Because I knew that at 4 years-old … I wouldn't be who I am today without a spiritual consciousness, without spiritual values and ultimately without spiritual love." But that's just it... since 2005, and now with her new Discovery Channel, seven-night special, called Belief, Oprah is making it all about "spirituality." In fact, the promo for the new series has this to say about her new venture: Seven billion people, searching for connection, redemption, meaning. 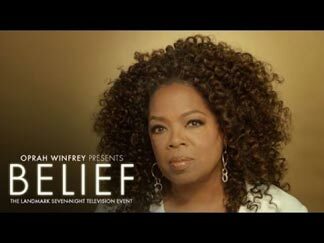 Oprah Winfrey presents the seven-night event, "Belief," a groundbreaking television event exploring humankind's ongoing search to connect with something greater than ourselves. Journeying to the far reaches of the world, and to places cameras have rarely been, “Belief” searches the origins of diverse faiths and the heart of what really matters. From the epic to the intimate, webbed throughout each hour are stories of people on spiritual journeys, taking them to sacred spaces. All that probably sounds good to today's culture .... but where is JESUS mentioned? If you call yourself a Christian, shouldn't you be talking about faith in Jesus... and not just spirituality? (Take another look at her first statement). And why isn't she saying (in her second statement) "I wouldn't be who I am today without JESUS," instead of "I wouldn't be who I am today without a spiritual consciousness, without spiritual values and ultimately without spiritual love"? Seems to me that's a whole lot of New Age drivel, and there are a lot of false gods out there who offer their spiritual wares and diverse ways to "sacred spaces". I just don't trust any of them! I wholeheartedly agree with Jennifer LeClaire, a writer for Charisma News, who wrote, "No, Oprah is not celebrating Jesus. She's taking people on a "spiritual" journey that includes many faiths and challenging them to ask the question: What do you believe? As for me and my house, we will serve the Lord Jesus Christ, thank you." And as Jennifer points out in her piece, Franklin Graham gets it right, too. "A personal relationship with Almighty God through His Son Jesus Christ is the only thing that can fill the void in the human heart," Graham said. "This is not a matter of opinion--Jesus said, 'I am the way, the truth, and the life; no one comes to the Father except through Me.' One way, one Savior, no exceptions." Did you get that, Oprah? No exceptions! And while I am having this conversation with Oprah in my head, I would like to give her a warning. Oprah, I know you have helped thousands of people less fortunate than you, and no doubt many of them might have considered seeking a relationship with God and Jesus because of your humanitarian efforts. But, dear, all those good deeds will mean nothing when you stand before Jesus's Judgment Seat and He asks you if you pointed them to Him. Because, believe me, He will know that your message was not the narrow path that led to Life, but that you offered entrance into "spirituality" through the wide gate that led to their destruction. Well, here we are at that next chapter, and it is her new TV show, Belief. I'm sorry, but how can there by growth in her faith, when she still will not credit Jesus for her success, or exalt Him as the only way to God? Until that happens, all the talk about spirituality and honoring different faiths will fall on my deaf ears. And, somehow, I don't think Jesus is going to like the fact that her "business side" is willing to compromise and make concessions for other faiths. When asked to define what spirituality is to her, Oprah said, "[It] is living life with an open heart, through love, and allowing yourself to align with the values of tolerance, acceptance, of harmony, of cooperation and reverence for life. She said she believes there is a divine thread that connects spiritually to something greater than ourselves." All of that sounds man-driven to me; nothing Holy or sanctified. If only she would realize that He alone is worthy of all her enthusiasm about searching for something greater than herself. Only then will she discover what true Belief is. Matthew 7:22-23 "Many will say to me in that day, Lord, Lord, have we not prophesied in thy name? and in thy name have cast out devils? and in thy name done many wonderful works? And then will I profess unto them, I never knew you: depart from me, ye that work iniquity." The thing that bothers me is this....If she is a Christian, then why is she still searching for ????????? what? And since when does the Bible say that we are to be tolerate and accepting of sin. Please, someone point that out to me if you can find scripture to that if you will, so I can be corrected! Maybe I misunderstood her statement. That would be my questions to her. Keep up the good work Belle. You bring much to the front that others will not even consider whispering for fear they'll be thought of intolerant, etc. Seems like so many of these people want to be a god themselves if you ask me. They have such a "following". Being nice, giving, helpful, etc., is great, but will not get any of us into the kingdom of our God. It's our acceptance of Christ Jesus as our Savior. There is NO GRAY AREAS in this just in case Oprah doesn't know it. And who or what is that "divine thread" she speaks of? Lots of "gods" out there these days from what I'm seeing and hearing for myself. It' painful in my heart to see so many deceived, even those close to me. Yes, Lisa! It is difficult to see so many Christians swayed and deceived by such "spiritual" talk. The more that our society and culture become focused on tolerance and acceptance, the more my Bible speaks to me about staying true to my Lord's commandments. And you are right... there are no gray areas. It really is black or white ... heaven or hell. Please, God, let your Holy Spirit stir up a sweeping revival across this land... before it is too late!